A Little About Herbal Medicine Herbal medicine is the oldest medicine on the planet and still the preferred medicine of the greater population worldwide. More than 80% of the world’s population uses Herbals as mainstream medicine, according to the World Health Organisation. Most of us do not have the slightest idea of how to achieve and maintain good health today. Our fast pace lifestyles, with polluted environments, alcohol abuse, drug dependencies, fast foods and high tech stress, make us susceptible to all sorts of illnesses, with many of them life threatening. The 3rd leading cause of death in the Western world today is the admission to a hospital!! What does this say for our healthcare system. We have simply lost the ability to take an active part in our own healing of ill health and in understanding the simplicity of achieving optimum health, through the cleansing, rebuilding and maintenance of our bodies, using pure, natural, cost effective herbs processed in the traditional ways. 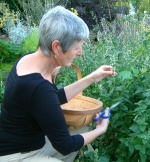 Cottage Hill Herbs “Diploma of Herbal Studies” is a unique way to study the uses and application of a wide range of herbs. Students work with the plants, grown organically, working from the ground up – learning practical methods of growing and use of herbs traditionally and clinically. We develop an intimate understanding of the plants when working with nature first hand. The aromas, scents and growth patterns speak to us and we each grow in an awareness of the other. Resources at the Herb Farm include many hundreds of herb plant varieties; an extensive library is available for student use, a herbal dispensary for clinical study and excellent resources focusing on real herbal medicine. The Diploma of He rbal Studies is a year long part time study programme conducted from the Herb Farm, with small groups of students working together in harmony with the plants using organic methods of production. Dozens of plants, herbal extracts, teas, capsule making, tinctures, ointments, oil blends, flower essences and skin care products are produced over the year by each student, giving first hand knowledge of the best methods of production most suited to each individual herb and how best to extract the ‘principle’ and most potent forces from each plant. This knowledge leads to opportunities for not only producing own individual herbal products and medications, but to the growing business and employment potential now available in this sought after field. Cottage Hill Herb Farm was first established in 1976 and is situated on the banks of beautiful Akatarawa River and operates on organic perma-culture principles. We take pride in being the leading education centre in New Zealand in hands on education with 40 years of experience, teaching herbal medicine and natural skin care. Dedicated to the preservation, study and dissemination of natural herbal knowledge. No prior herbal knowledge is required for this course, although the commitment to complete assignments given throughout the year is essential. This involves approximately 3 hours per week in addition to class attendance. Graduation is not subject to examination, but is assessed on adequate completion and understanding of all assignments given over the year’s course. Class numbers are strictly limited to 8 students only. 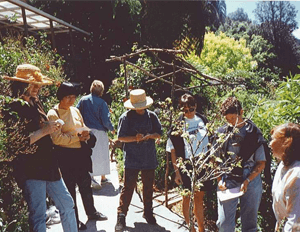 The class year consists of monthly attendance of one full weekend per month, held at the Herb Farm. Assignments and further weekly study is conducted during students own time, but is a requirement of attendance. On time regular attendance is also required, as is prepayment of student fees. All materials, herb plants, seeds, bottles etc are supplied. All ointments, crèmes, tinctures, capsules etc – produced by students are supplied at no additional cost to students and become the property of each student. Personal paperwork and books are not supplied, but notes where required are provided, other than those taken during class. 1. Introduction to Herbal Medicine and Herbal Terminology. 2. Body Systems, Disease, Nutrition Therapy. 3. Herbal Therapeutics, Herbal First Aid. 4. Herbal Medicine and Animal Treatments. Including production of animal care products. 5. Herb Identification, Collection and Cataloging of 50 Herb Specimens. 6. Horticultural Methods, Propagation, Harvesting, Drying and Seed Collection. 7. Understanding the Elements of Health. 8. Holistic Nutrition, Diet, and Detoxification. 13. Production of Ointments, Salves, Tinctures, Oil Blends, Capsules, Formulas and Herbal Teas. 14. Formulations, Poultices, Compresses, and Powders. 15. Natural Skin Care Creation. 16. Running a Chemical Free Home and Formulation of Cleaning Products. All enrolments must carry completed enrolment form with deposit. Click here to download an enrolment form.